As leaders, paying attention to the important generational trends and shifts that underlie the surface stereotypes can give us great insight into managing the people on our team. Bruce Tulgan, an author specializing in management training and generational diversity in the workforce, joins me on this episode of The TalentGrow Show to talk about how to help leaders successfully navigate generational trends in the workplace. We discuss what Generation Z wants from leaders, how leadership expectations differ from Generation X to Generation Z, and what we can do to better lead different generations in the workplace. Tons of interesting insights and actionable tips. Listen here and don’t forget to share this episode with others in your network! Bruce Tulgan is an adviser to business leaders and a sought-after keynote speaker and seminar leader. He is the founder and CEO of RainmakerThinking, Inc., a management research and training firm, as well as RainmakerLearning.com, an online training service. Bruce is the best-selling author of numerous books including Not Everyone Gets a Trophy (Revised & Updated, 2016), The 27 Challenges Managers Face (2014), and It’s Okay to be the Boss (Revised & Updated, 2014). TEASER CLIP: Bruce: Institutions are in a state of constant flux now. Individuals, more and more, people of all ages are realizing that they have to take care of themselves and their families and they can’t really rely on institutions to be the anchors of their success and security. The information tidal wave just grows and grows and grows. The pace of change is accelerating. So all of these macro forces are transforming the workplace and the workforce, and meanwhile, on a micro level, most people are just trying to take care of themselves and their families in a post-job security era. I think the biggest change that I try to help business leaders understand is that people are not free agents because they’re disloyal or because they have short attention spans or because the Millennials, there’s something wrong with the Millennials. What’s going on in today’s world is, people are free agents because they have no other choice. Halelly: Hey TalentGrowers, welcome back. I’m Halelly Azulay, your leadership development strategist here at TalentGrow and on today’s show, we are talking about generational trends in the workplace and how to be a better leader based on research. I know that the topic of generations and the change and the future of the workplace has been coming up a lot because we’re all thinking about it so much – what are the trends that we’re seeing? What are the changes? How do we need to upgrade and update our own practices as leaders to make sure that we’re staying on track and keeping up with the times? 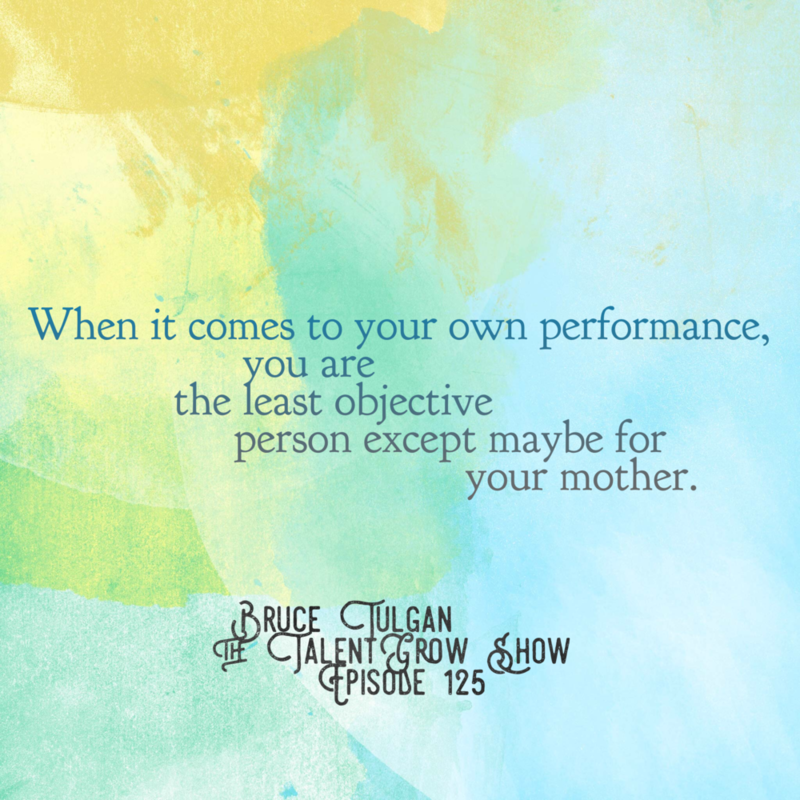 This week my guest is Bruce Tulgan, who has written several books on this topic and conducted a lot of longitudinal studies that produced really interesting results, some of which he’s going to share with you today. I hope that you enjoy it. I’d love to hear what you thought about it afterwards. Without further ado, let’s listen in to this episode with my guest Bruce Tulgan. Welcome back TalentGrowers. This week my guest is Bruce Tulgan. He’s an advisor to business leaders and a sought after keynote speaker and seminar leader. He is the founder and CEO of Rainmaker Thinking Inc., a management research and training firm, as well as RainmakerLearning.com, an online training service. Bruce is the best selling author of numerous books including Not Everyone Gets a Trophy, The 27 Challenges Managers Face and It’s Okay to be the Boss. He was recently a speaker at a conference where I also was a speaker. We connected there, finally, because I’ve been watching his work with interest over the years, so I’m very glad that Bruce has agreed to come onto the show. Bruce, welcome to the TalentGrow Show. Bruce: Thank you so much for including me. Halelly: My pleasure, and thanks for making time. Before we get into the very interesting perspective that you bring on the changes in the workforce and the different generations at play, I always ask my guests to describe their professional journey very briefly, just so we get an idea of where you started and how you ended up where you are today? Bruce: Well, gosh, I guess the best way to say it is in the early 90s, I was an unhappy lawyer at No. 2 Wall Street in New York City, and running around doing what the grownups told me. I was very young. I ended up writing a book called Managing Generation X, which came out just the right thing at the right time, and then everyone started calling me. Since then, we’ve been interviewing people on the frontlines of the workplace, more than half a million people, more than 400 organizations have participated in our in depth interviews over the years, and having all that data at our disposal, we’ve turned that into a lot of books and worked with a lot of organizations to help them on their talent strategies and their leadership best practices. In particular, one of the things we’ve become best known for is understanding generational change in the workplace. It’s been 25 years now. Halelly: That’s amazing, actually, pretty great. I love hearing stories about people who pivot their career and how those pivots come to be, because I love when people are doing what they enjoy doing, rather than continuing down a path that doesn’t feel fulfilling. Thank you for doing that and showing the way. As you said, you’ve been really doing a lot of research which is quite impressive, and you’ve done several longitudinal studies with really fascinating results and have created books and white papers. I was reading one of your white papers called “The Great Generational Shift” and in it you describe some really big changes that are happening in the workplace of today and the workplace of tomorrow. I think we can definitely – or you draw – some lessons for leaders. What do you think are some of the most important trends that we should be aware of? Bruce: There’s a huge macro shift underway in the workforce that we’ve been tracking, now as I said, for 25 years. Some of this goes to even larger macro forces like the great forces of history – globalization and technology have been shaping change for 13,000 years or so. Maybe longer, as long as human history goes back. What we’ve been seeing is that these changes have reached a point where the world is so highly interconnected, rapidly changing, fiercely competitive, knowledge-driven. Institutions are in a state of constant flux now. Individuals, more and more, people of all ages are realizing that they have to take care of themselves and their families and they can’t really rely on institutions to be the anchors of their success and security. The information tidal wave just grows and grows and grows. The pace of change is accelerating. So all of these macro forces are transforming the workplace and the workforce, and meanwhile, on a micro level, most people are just trying to take care of themselves and their families in a post-job security era. Halelly: Okay, well, that’s very interesting, because now we have Generation Z. Are they Millennials? Bruce: Of course demographers are always trying to figure out the newest emerging generation, and it’s always a work in progress. We ourselves have been tracking what we call the second wave of the Millennials – those born in 1990 and later – because the Millennials start in 1978, so the oldest Millennials are 40! Halelly: Right, they’re not like new kids on the block. Bruce: Exactly. It may be that 40 is the new 30, just as 30 is the new 20, just as 12 is the new 19! But be that as it may, they’re 40. So when we look at those born 1990 and later, we are looking at the second wave Millennials and trying to figure out when does the post-Millennial era start? Researchers seem to be settling on 1997 as the first birth year of the Post Millennials. By consensus, they seem to be becoming known as Generation Z and in fact, this summer we interviewed 4,093 Post Millennials, by that definition, and did a Generation Z study which in fact was included in a front page story in the Wall Street Journal which was “Ready, Set, Strive: Get ready for Gen Z” or something like that. It was front page of the Wall Street Journal about the Post Millennials. Funny enough, the Post Millennials have a feel almost of children of the 1930s, because they didn’t grow up in the go-go 90s. They came of age in the 2000s after 9/11, so war, fear of terrorism, environmental collapse, economic uncertainty. They’re like children of the 1930s, if children of the 1930s had learned how to think, learn and communicate while attached to handheld super computers and if they had helicopter parents on steroids. Halelly: This is interesting, and we’ve talked about this on several recent episodes, because it just keeps coming up. One of my previous guests, I don’t know if you’ve met Jessica Kriegel, she wrote the book Unfairly Labeled, where she as a Millennial kind of pushes back on what she thinks is a generational stereotyping. We tend to look at groups and when we describe a whole group and ascribe characteristics to them, it starts to sound like if you swapped Generation Z for some other word – like Asians or Blacks or something like this – this would not fly. You could not do that. Why are we doing this to them? I know that you’ve done this study about the Generation Z. Did you find that the characteristics were indeed generational or generation-based in their preference? What are your thoughts about that? Bruce: My way of explaining that is, looking through the generational lens is like looking through any diversity lens. Of course you always have to be careful about making vast generalizations about tens of millions of people at a time, and I often say to my clients, “You have to be very careful about making vast generalizations about tens of millions of people at a time, so please forgive me because I’m about to do that.” But the reality is, there are many stories within each generation as there are people. Having said that, it’s still useful to look through a diversity lens to better understand shared experience, shared perspective, where people are coming from, where they’re going. I always tell people, our research is not going to do that thing where at the end of reading one of our books or going through one of our seminars you can just go up to people and say, “Give me your driver’s license. Now I see what year you were born and let me get out my cheat sheet for how to manage you.” To me, that kind of thing is ridiculous, and that would be as offensive as it would be if you said, “Let me get out my cheat sheet for managing middle 30-something women of Greek descent who live in Seattle.” It’s just silly. Having said that, it’s not silly to look at data about people who fall into different categories and try to understand their shared perspective. Generational difference is, everybody goes through these natural development life stages. Sometimes people say, “Isn’t it just about being young?” And then being a little older and being a little older than that. Everyone starts out young and gets old, God willing. But what makes for generational differences, those accidents of history that occur at different life stages. So where the natural developmental life stages intersect with the accidents of history, that’s what makes for generational trends. We all lived through 9/11. If you were 10 when 9/11 happened, that’s very different than if you were 50 or 40 or 30. Where you met that accident of history in your developmental life stage, that’s how you start to understand generational differences and those, because of their history, they are accidents of history, so they are shared by generational cohorts. Having said that, it’s useful to understand where people are coming from, where they’re going, it’s useful to understand change over time, broad trends, but you have to be very careful. There are as many stories within each generation as there are people, and what we try to do with our generational research is not give people a cheat sheet for how to manage Millennials, a cheat sheet how to manage grownups. It’s more that here are the best practices for managing, and here are some things you might want to be aware of that are trends when it comes to younger people in the workplace, where they’re coming from and where they’re going. Halelly: The questions that you’ve asked and the people you’ve interviewed, for example, to see the trends of Generation Z that you have in your Wall Street Journal article and so forth, were they the kinds of things that you had asked people of various ages and saw that there was a trend of people of that generation to go a certain way? Bruce: What we see primarily is a continuation of trends, so we started doing this research back in the early 90s and we began to see trends that are continuing today. A resurgence of self-reliance as a value, a moving away from relying on established institutions, grappling with the information tidal wave, adjusting to the accelerating pace of change. On some level, what you see from X to the first wave of Millennials to the second wave of Millennials to the Post Millennials, a lot of what you see is a continuation of trends. On the other hand, there are some stark contrasts. For example, Generation X, when we grew up, the parenting style was still permissive, hands-off, Gen Xers were relatively unsupervised compared with fast forward to the norms of parenting in the 2000s, and the Post Millennials are the most over-supervised generation in history. So that’s an example of within a larger trajectory of trends that have remained somewhat consistent, there have been some huge shifts like going from under supervising young people to over-supervising them. That does result in different attitudes and behaviors in the workplace. Similarly, the information environment, while it has been progressive, if you have a handheld super computer now but you learned how to think, learn and communicate in the 70s and 80s, very different from if you learned how to think, learn and communicate while attached to one of those machines. Halelly: Great. That makes a lot of sense, and the trends that you found were really fascinating. Like for example, what do they seek? What’s most important to them in a job? What’s least important to them in a job? You have some great graphics on your website, we’ll link to it, that can show some of these trends and they’re fascinating. As leaders, you just said, “I don’t have a cheat sheet, and these things are general trends,” so what was interesting to me also is that in your research, you report that you asked people about the kinds of leaders that are exemplary, the kinds of leaders that people love to work for, that consistently deliver the highest productivity. I’m quoting from your study, “The managers whose employees consistently deliver the highest productivity and quality with high retention of high-performers and high turnover among lower performers through the best business outcomes and high morale and team spirit,” like, whoa, we all want to emulate that. As listeners of the TalentGrow Show we’re all aspiring or currently leaders, building our leadership skills. So what are they doing differently? You say in your studies, the common denominator among those managers was an abiding commitment to the fundamentals, relentless, high-quality communication.” I’d love for you to tell us a little bit more about that. Bruce: Thank you, and that was a great example of leadership in this interview. I appreciate your guidance and direction. You have just demonstrated that kind of high-quality, structured guidance and direction. This is what we’ve come to over and over and over again, what works is strong, highly engaged leadership. That’s leaders who make good use of team huddles, and then good use of one-on-one coaching. So managers position themselves as a coach, as a teacher, as a supporter of the individual, and that doesn’t mean come to work whenever you feel like it and bring your dog. One of the things that is so unfair about how people look at the Millennials is they think the Millennials want to be humored at work, or the Post Millennials want to be humored at work. Generation Z, that they want to be humored, that they want to come to work whenever you feel like it and bring your dog. No, they want to be taken seriously. They want to be set up for success by serious managers who spell out expectations, make sure they have the tools, make sure they have the clarity on goals, make sure that they know what to do and how to do it, that they’re getting regular feedback so they’re not wasting their time going in the wrong direction. That’s what young people – people of all ages need this – but if you think young people are coming in and wanting everything on a silver platter and to be left alone to do it however they want, and be humored, that is not what young people are looking for. The data that we got this summer, the number one thing Post Millennials care about in a job is a supportive leader. The number two thing is relationships at work with people who they take seriously and who take them seriously. The human element is what matters the most, and that is the old fashioned basics. What works is when leaders spend time guiding, directing, supporting and coaching, everyday, every other day, in structured one-on-ones, where they spell out expectations, they provide good, meaningful, candid feedback, course correction, troubleshooting, problem solving, they help people plan resources, they help people keep score for themselves, they help people get extra rewards when they go the extra mile, and they help people not to go too far in the wrong direction. Halelly: I think in reading your work, you describe how one of the big changes was that the younger generations are no longer okay with thinking long term or having the goals be really long range because of some of the trends you’ve described. They would like to have much closer end targets to meet. And knowing not only what do they need to do, but how are they going to know if they hit it or not? Bruce: Exactly. What does success look like? What I think young people say, okay, you want to talk about accountability, that’s great. The idea that young people don’t want accountability is nonsense. You want to talk about accountability, then I want to know, “What do you want me to do? How do you want me to do it? How are you going to measure it?” You do your part. And not only that, but if you talk to me about things that are going to happen in five years, that sounds like a fantasy. Talk to me about things that are going to happen in three years, that’s great, but you don’t know where you’re going to be in three years. Halelly: And whether a robot is going to be doing your job or not! Bruce: Right, so when the boss says, “Here’s where you’re going to be in three years,” young people are thinking, “You don’t even know where you’re going to be in three years.” So let’s talk about this month, break it down, spell it out and tell me how you’re going to keep score so I know if I’m winning. Halelly: It’s rough. It’s hard to change, especially as you’re describing, for example, I’m also Gen X, so latchkey kids, left alone, left to our own devices, figure it out. If you grew up that way and you’re used to it, and then you’re also in a certain stage in your career because of your tenure that you can be left alone because you know what you’re doing and you’ve got experience, then you need to adapt to the demands and the legitimate needs of people that are in a different place not only because their level of experience but also the circumstances under which they grew up and you’re leaving them alone. Which is maybe what you most would wish for, for yourself, but it’s not going to work. Bruce: Yeah, but look. I think you’re exactly right that one piece of the puzzle is that they’re at a newer stage in their career. Another piece of the puzzle is how they’ve been shaped and their expectations on how they interact with authority figures is much more high frequency, much more high-support than say Gen Xers in particular, as a point of contrast. It’s also the speed and complexity of business today. This is true of every industry, at every level. The speed and complexity of work, the cross functional nature of cooperation on a daily basis in just about every job, that things are moving at such a pace that that’s the bigger business reason why leadership needs to be much more granular, much more frequent. Everything needs to happen a lot faster. Everybody has less time to go in the wrong direction, competition is more fierce, and so it’s not just that they’re new. It’s not just that they’ve been shaped this way, but look, the reality is even if Gen Xers got away with being left alone and doing things their own way. Nobody is the most objective person about him or herself. When it comes to your performance, you are the least objective person except maybe for your mother. Having an objective third party help you stay focused and driving toward goals, guidelines, parameters, timelines, that’s helpful for anyone. That’s why elite performers have coaches. That’s number one. Number two, in fact we expect people to shift more quickly, to deal with more complexity, to move at a faster pace. That requires more support from leaders. Halelly: And more communication. Was there any one or two findings on that study of the Post Millennials or Gen Z that was counterintuitive or surprising? Bruce: The thing I think was most reportable was the digital generation cares most about the human element. That’s what jumped out at us. We were looking at, okay, we didn’t think we’d find this because we’ve kept our finger on the pulse for a long time of young people, but to hear managers complain, you’d think that every young person was showing up saying, “Let me come to work whenever I feel like it and bring my dog and don’t make me work and when do I get to take a nap?” That’s just not where young people are coming from. They’re saying, “Tell me what you want me to do today, tomorrow, this week. What do you have to offer me and I want a strong, highly-engaged leader here, setting me up for success and helping me keep track of my success and helping make sure I don’t go in the wrong direction for too long. I want to work with people who take me seriously and people whom I can take seriously.” The digital generation values the human element, and that I think was interesting and for us, not surprising, but I think it was surprising for a lot of people. Halelly: Great. Thank you for sharing that. That’s a really good encapsulation. Before you share one actionable tip, as we always do, what is new and exciting on your horizon Bruce? Bruce: Well, we’re right now studying the complexities of cross-functional collaboration in the workplace. That is the big problem we are putting our research engine on right now. What people are telling us is, as difficult as communication is up and down the chain of command, the inter-dependency revolution is accelerating and everybody is getting requests from lateral colleagues and diagonal colleagues and dotted line bosses and everybody needs to rely on each other, so there’s so much need for cross-functional cooperation. At the senior most levels, it seems like C level leaders have decided, “This is the way we’re going and there’s no other way to compete in today’s environment.” But the further down the chain of command you get, the more people are struggling to acquire this new skillset and this new relationship savvy, so that’s what we’re focused on right now. Helping people master interdependency. Halelly: Sounds fascinating. Have you already published this or is this something that’s coming? Bruce: This is the book I’m working on right now. Halelly: That’s exciting. I can’t wait to hear more about that. Maybe we’ll have you back on when that comes out. So one specific action that our listeners can take today, tomorrow, this week, to upgrade their leadership skills or their own career development skills? Bruce: Here’s my advice. For three weeks, set aside an hour a day to get in shape as a leader. Whatever level you’re at. Just like you would if you were going to take a walk everyday for three weeks and get in better shape. That is set aside an hour a day and plan that time, set aside 20 minutes to meet with your leader, manager, supervisor. Even if it’s once a week, and get some clarity about what’s expected of you, and let your leader know you’re going to be meeting with your direct reports more closely and then everyday, meet with two people, three people who report to you one-on-one, and ask them, “What are you planning to focus on today? What are your priorities? Tell me what problems you’re facing, what decisions you need? Show me what you’re doing. Show me how you’re doing it, and tell me good news. I’m going to try to be more involved. I’m going to try and help you.” And set aside an hour a day for three weeks and see if you don't get addicted to being a supportive coaching style leader. You won’t believe how big of a difference it makes. Halelly: I’m glad you’ve broken it down to something that sounds doable, because it doesn’t sound daunting. Yes, an hour is more than the zero maybe that you’ve been spending on it, but an hour is something that all of us can envision ourselves successfully accomplishing and it’s actionable, super actionable. Bruce: But don’t let managers get away with touching base. “How’s everything going? Everything on track? Any problems I should know about,” or, “Hey, let me know if you need me? Come interrupt me during the day,” or, “I’ve got to put out this fire.” That’s not what I’m talking about. I’m talking about an hour a day, for getting in front of your leadership challenge. Talking with people before anything goes right, wrong or average, in a structured way, on your schedule. Just like talking a walk and eating your brussel sprouts. Halelly: Have you found there to be some kind of a magic number? How long should you aim for, for these structured one-on-ones that are now happening more frequently? Bruce: If you know you’re going to go to the gym all day, you don’t have to stay at the gym all day, right? So if you know you’re going to work out everyday, you can choose your focus everyday. 20 minutes should be fine. If you’re going to talk to people every other day or once a week, then 20 minutes is fine. Talking with your people in a structured one-on-one shouldn’t be a special occasion. It should be how you structure your relationship with them. Halelly: Awesome. I know people are going to want to read more from you and hear more from you and learn more about you, so what is the best place for them to do that, Bruce? Bruce: If you go to our website, RainmakerThinking.com, and there’s tons of free stuff at RainmakerThinking.com. Halelly: There really is. So much. Of course we’ll link to that in the show notes and link to your books. Are you on social media? Should they follow you anywhere? Bruce: @BruceTulgan on Twitter, and we’re on LinkedIn. Yes, we’re on all that stuff. We post a lot of links on Twitter. Halelly: Great. Then we’ll link to that as well. Bruce, thank you so much for making time today and sharing your insights with the TalentGrowers. Bruce: Absolutely. Thank you so much for including me. Halelly: My pleasure. I love it. The suggestion Bruce made is so meaningful, but also so specific. And so doable. I love to have actionable tips like this, and TalentGrowers, you know that I want you to take action, because the reason this podcast exists is not just to light some light bulbs in you, but to also make some impact and only action makes an impact, not just ideas and insights. Go to take action. It’s not that hard. Start somewhere. Start small. Follow Bruce’s advice and I know you’re going to see an impact and it’s going to make a difference. I’d love to hear what impact it had on you. I’d love to hear what you tried and how it worked, so as always, I’m open to your feedback on any channel that you prefer, and that you found this valuable. If you did, maybe share it with one or two other people that you think will also benefit from listening, and I will appreciate that so much. Thank you for listening. I’m Halelly Azulay, your leadership development strategist here at TalentGrow and this has been another episode of the TalentGrow Show. Until the next time, make today great.